Always check for Rockfish Conservation Areas. Some rockfish stocks, such as bocaccio and inshore species such as yelloweye, quillback, copper, china, and tiger rockfish, are at low levels. Avoid rockfish by fishing away from rocky reef areas, key habitat for these fish. Carry a descending device to release accidental catch. Allowable gear is subject to in-season change. Always check the latest closures and restrictions for the area where you are fishing. When sport fishing, you may not waste any fish suitable for human consumption. However, you are allowed to use fish offal, herring, mackerel, northern anchovy and Pacific sardine as bait when fishing with traps. Rockfish often do not survive catch and release. When rockfish are caught accidentally, proper release techniques can help reduce mortality. 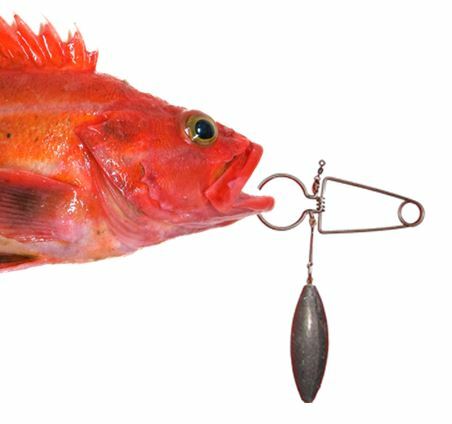 To greatly improve rockfish survival rates, by condition of licence, anglers in vessels shall immediately return all rockfish that are not being retained to the water and to a similar depth from which they were caught by use of an inverted weighted barbless hook or other purpose-built descender device. DO NOT bring large halibut on board your vessel to measure. Halibut are a very powerful fish and can cause you serious injury. If you believe you cannot properly measure a large fish safely and accurately enough to comply with the length requirement then release the fish. Head-off Measurement (maximum 97 cm) – To aid in transporting your catch, you may remove the head from a halibut that you are keeping. Measurements are made from the base of the pectoral fin at its most forward point to the extreme end of the middle of the tail, as shown in the image. Note: it is the responsibility of recreational fish harvesters to ensure the pectoral fin measurement is legal before the head is removed. Know the location of the Rockfish Conservation Areas. Rockfish rarely survive after being caught, so keep what you catch within your limit. Handle catch as little as possible, using wet hands to preserve the protective slime coat. Move to another area or change your gear or fishing method if you reach your rockfish limit. To greatly improve rockfish survival rates, release incidental catch quickly using any descending device. It is your responsibility to ensure the species, number, size and weight of your catch can be readily determined. For rockfish and lingcod, packaging and labelling is the same as that described for salmon. An individual may fillet the fish in two pieces (as with salmon). Skin must remain on each fillet for identification purposes. In those cases where a size limit applies, such as 65 cm. (26 in.) for lingcod, the fillets, including the tail, must meet the minimum "head off" size limit of 53 cm. (21 in.). The International Pacific Halibut Commission (IPHC) has an ongoing tagging program to monitor halibut migration and mortality. A plastic-coated wire tag is attached to the dark-side cheek tissue of the halibut. Dart tags may also be found on or near the head or embedded in the body. Additionally, halibut may be tagged with large electronic satellitetags attached to the dark side just below the dorsal fin, which records temperature and depth. Satellite-tagged halibut may have the entire tagbody (see photo) or only the plastic leader and dart, meaning that the tag body has detached from the fish. Each type of tag has a unique number and IPHC printed on the side.